Saucy, right? It would make you mad too if you were competing for the same readers. In the year 2000, while Random House was busy promoting my first novel, A Conspiracy of Paper, as the historical novel of the season, Grove was promoting The Dress Lodger by Sheri Holman in precisely the same way. Consequently, I hated Sheri Holman’s guts. I began reading her reviews and interviews with considerable malice. I bought her book to see how bad it was, and I was furious that not only was it not bad, it was really, really great. I think we can all agree that writing a great book that competes with my novel is rude. 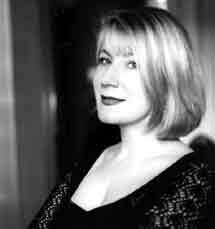 And then there was that saucy author photo, which made me hate her even more. It turned out that on my first publicity tour, she and I were to appear at the same book-and-author brunch in Toronto, and I was getting all worked up to hate her guts in person. Then we were seated next to each other and became friends over the course of about 45 seconds. It didn’t hurt that she’d hated my guts from afar too. We’ve been friends since, and I’ve been in awe of her books since. She’s my pal, so I don’t have to resent her awesomeness. 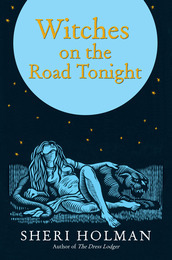 Sheri’s work is always accomplished, smart, engaging, emotionally disarming, and completely absorbing, but her new book, Witches on the Road Tonight, is impressive by even her standards. This is a thoughtful meditation on the legacy of fear and family dysfunction, but it is also a page-turner about disturbed and disturbing characters who (hooray!) often behave horribly, but whose bad behavior is affecting human. Click on the pretty book cover for more info. Then buy it or face my wrath.